If there was ever a month I have a love / hate feeling for it is February. Love that it's short, and love that it's a month to celebrate the historical achievements of my heritage (though I'm one of the ones who celebrates Black history all day, everyday...), but it's also that weird month where the weather is wonky, spirits are still in hibernation mode...and then, of course, there is Valentine's Day. As a hopeless romantic I don't really abhor love's biggest holiday, but when you are unlucky in love, always walking solo, the day and its (heavily commercialized) build-up can be a little annoying --- and somewhat depressing. To quell depression, gooey assorted chocolates are good, but music is even better and Muhsinah is offering a ticket to ride on her love train with her February EP, and all those who have a heart (or who aren't too grouchy) can climb aboard and let a little love in.If it has slipped your mind, Muhsinah is making 2016 a year to remember as she's dropping new tunes monthly, previously charming with the festive January EP. 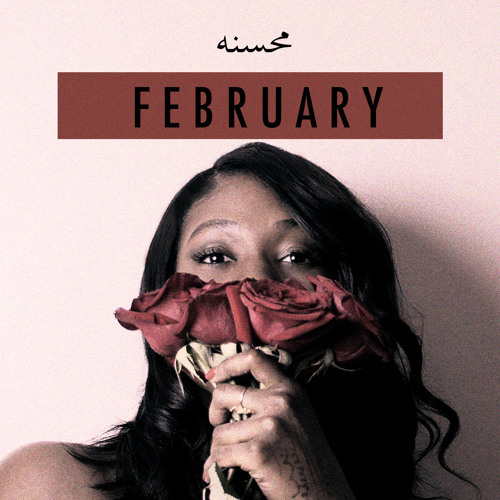 With February Muhsinah has slowed the vibe down a bit (for obvious reasons) as she configures all of love's lines, angles, and rhymes. Of all the 3 1/2 songs (opener "YGML" is but a mere 43 seconds), "Heaven" and "Gorgeous" stand out to me. Riding on vigorous percussion, "Heaven" is kinetic like a pep rally cheer, but has an alternate face of serenity as it coasts on astral synths that are so agile that they elevate right towards the cumulus. "Gorgeous" lives up to its namesake as it declares love bold and intimate amid a dark churn of piano and strings, and its Muhsinah at her most refined --- truly a breathtaking piece of art the song is. So if you have a pulse, and if it isn't somewhat racing by the end of this collection, then I can only conclude that a icebox is where your heart used to be, as February is where love's doubters become true believers.